Discover why it’s so important to maintain clean doors throughout your office. Cleanliness is one of the most important investments you can make in your commercial office space. It doesn’t matter how well designed a space is, if it is cluttered, disorganized, or just downright dirty, people won’t be impressed. And, unfortunately, that impression about your space becomes an impression of your brand and you. Cleaning your office space or having a commercial cleaning service come out to clean it for you is vital. This includes your doors; read on to see why. How Do They Get Dirty? Unless every single door in your office is automated, each one is touched by dozens of people every day. 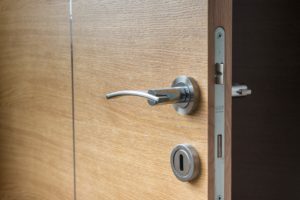 Think about how many doors you touch: from your office to the break room, to the bathroom, back to your office, to the copy room, to a coworker’s office – you touch a lot of doors and so does everyone else. And all those people touching all those doors are also coughing and sneezing in their hands, touching shoes and shoelaces, going to the bathroom, petting animals, and who knows what else during the day. That’s a lot of germs that can transfer from their hands to yours via a door, especially during cold and flu season. Many office doors are dark wood or painted a dark color. This is great for the visual aspect of the office because they don’t look dirty. But when they don’t look dirty, it’s easy to forget how dirty they actually are and it becomes easy to forget to clean them. Dirt and dust can build up, especially on the tops of the doors, and become an issue for people with allergies or asthma. Illness can also easily spread throughout the office through dirty doors if anyone has a cold, the flu, or any other contagious sickness. Cleaning a door is really easy. If you’re doing them yourself, you need a microfibre cloth and a disinfecting cleaner. Spray the cleaner and wipe it away with the cloth. If there are areas of stubborn, visible dirt, you may need a light brush, but often all it takes is elbow grease. If you do use a brush or scrubby, be careful not to damage the paint on the door and frame. Make sure you thoroughly clean the whole door: the front and back, the entire edge (including the top which no one ever sees, but where dirt builds up quickly), and the frame. Finally, don’t forget the doorknob! This entry was posted on Friday, April 5th, 2019	at 2:38 pm	and is filed under Commercial Cleaning	. You can follow any responses to this entry through the RSS 2.0	feed. Both comments and pings are currently closed.